Children's videos. Learn to dance, Zoe, Sesame Street, Creative Movements and Hula. Tahitian Dance is the most exciting and popular of all Polynesian dances. In recent years more and more people are realizing that the original dance of grass skirts swishing to the rapid rhythm of drums is the Tahitian dance instead of the hula! This is a FUN instructional video for the boy and girl dancer. 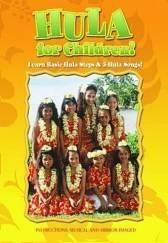 Now anyone can learn how to dance Tahitian, the "Ori Tahiti", in these easy step-by-step lessons. Mirror-imaging concept is used in this DVD. The student will be learning by following the movements of the instructor as if looking into a mirror. Each step is taught with music which conditions the student to feel rhythm. The lessons progress from simple movements to those of increased difficulty. Dances of Tahiti features two main types of dances that every dancer should know; Aparima: story telling by music and lyrics; and Ote'a: dance expressions by rhythmic drum beating. You will learn three dance routines and four basic steps. Each song is taught by a verse or phrase at a time. The music and dance are slowed down for easier learning, then the entire dance is done at performance speed. See also Dances of Tahiti for Everyone. Put on your grass skirt and hula with the best of them. This video teaches the hula with three easy step-by-step lessons, each a little more challenging than the last. Surrounded by the lush and beautiful scenery of Hawaii, the skilled hula instructor will encourage your child to feel the rhythm of the music as they dance to the traditional hula songs, "Kaholo-Hula", "Pearly Shells", and "Hukilau". Also, check out Kids Dance Videos and DVD 1, Children's Videos 3, Kid's Video 4, Hip Hop, Breakdance, Ballet, Tap or view all our Dance Videos and DVD. Recommend this Kids Dancing page to a friend.